Ottawa, ON – Mitacs and the German Academic Exchange Service (DAAD) are pleased to announce a bilateral student research mobility agreement through a memorandum of understanding exchanged yesterday. The agreement, signed by Alejandro Adem, Chief Executive Officer and Scientific Director of Mitacs, and Dr. Dorothea Rüland, DAAD Secretary General, fosters student mobility between Canada and Germany, with each country hosting up to 60 top-ranked undergraduates each year, starting in the summer of 2017. The exchange occurred during the 23rd Meeting of the Canada-Germany Commission for Scientific & Technological Cooperation, which promotes bilateral, research-based collaboration. Valued at $5.4 million, the agreement represents a significant shared investment in research initiatives of mutual interest and benefit to the two countries and their young researchers. Canadian students will travel to Germany through the DAAD’s Research Internships in Science and Engineering (RISE) program, or the joint RISE-Globalink Research Internship Program. It provides summer internships for undergraduates at German host universities and institutes, where they are matched with PhD students whom they assist and who serve as their mentors. They also gain first-hand knowledge of the German research landscape and strengthen their international networks. German students will apply for the Mitacs Globalink program, or the Globalink-RISE Research Internship Program, which brings top-ranked international students to Canadian universities. Under the supervision of faculty, each student undertakes a research internship. While in Canada, these students work with graduate students and research associates, receive professional development training, and experience the one-of-a-kind educational, social, and recreational opportunities Canada has to offer. A survey released earlier this week indicates the Mitacs Globalink program helps attract the world’s top students to Canada and creates future collaborations for them with their host professors or other researchers. Additionally, the majority of past Globalink participants indicated that their program participation has, or will have, a significant impact of their careers. 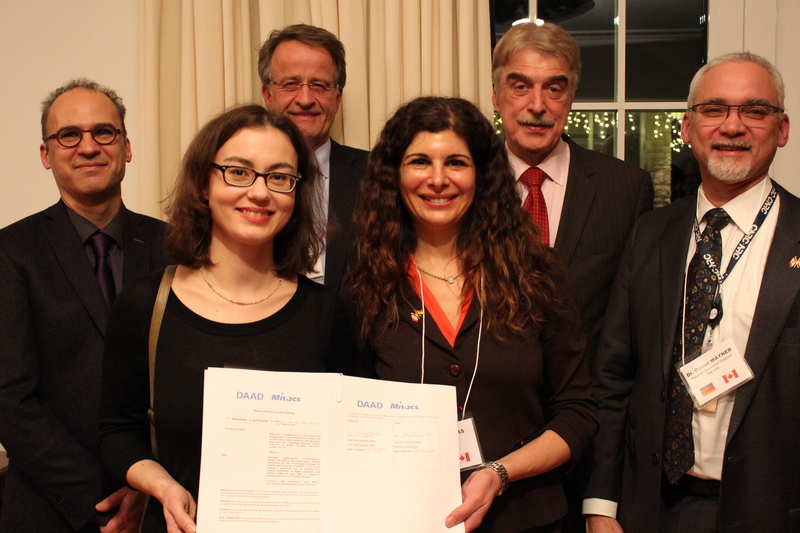 The DAAD and Mitacs previously signed a letter of intent in April 2015 to establish a student exchange. The agreement formalizes the partnership and covers students in biology, chemistry, physics, earth sciences, and engineering. Within Canada, Mitacs has worked with 60 universities, thousands of companies, and federal and provincial governments, building partnerships that support industrial and social innovation. Since 2009, Mitacs has matched over 1,750 international senior undergraduates with Canadian faculty through its Globalink initiative. To further strengthen international research collaborations, Mitacs Globalink currently offers two-way mobility opportunities between Canada and partner countries — Australia, Brazil China, France, India, Japan, Mexico, Saudi Arabia, Tunisia, and Vietnam— for undergraduate and graduate students. The DAAD is the world’s largest funding organization for the international exchange of students and researchers. It promotes international academic cooperation through a variety of mobility programs that bring international students and faculty to Germany for study and research and send German scholars out to the academic settings around the world for similar activity. In 2014, 302 Canadians received DAAD funding to study or do research in Germany — and 997 German scholars came to Canada with DAAD scholarships or grants. The DAAD’s Research Internships in Science and Engineering (RISE) program was founded in 2005 and is among the organization’s most successful and popular mobility programs. It funds exceptional bachelor-level students who have been selected to carry out research work in the labs of professors or doctoral candidates both in Germany and around the world.